ECW Cavalry - part 10 - Target Achieved - two units finished in one night ! 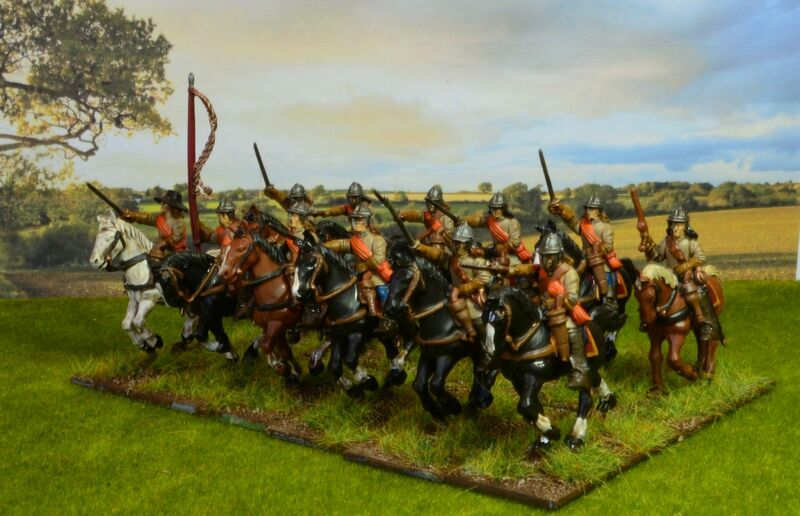 These units can be differentiated by the colour of the saddle cloths...but if needs be I can combine to make an uber large regiment ! 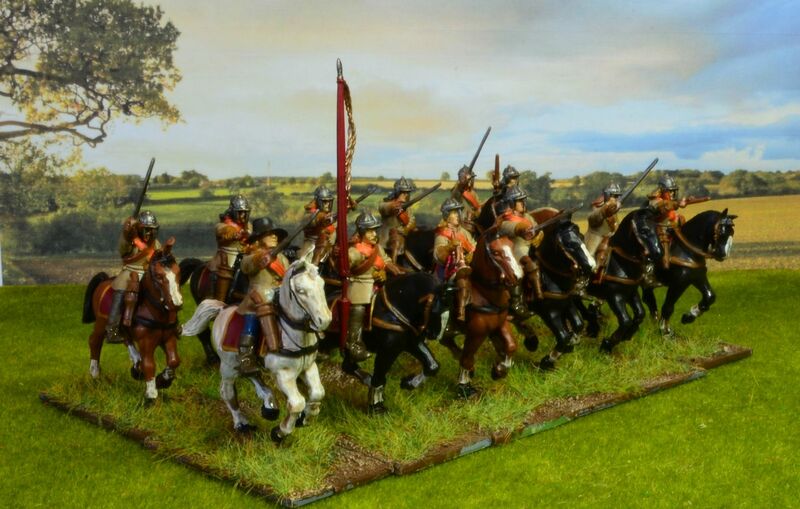 One of the advantages of painting so many horse in one go was the option to sort the various riders into distinct groups (eg with sash, without sash etc) for this unit I was ale to complete all the riders in armour including tassets. The target I set myself to deliver is really helping my to push forward and at this rate I'll have the cavalry completed in no time.. So with three down I have two left to finish...now that its the weekend I should be able to get both these done in the next 24 hours. 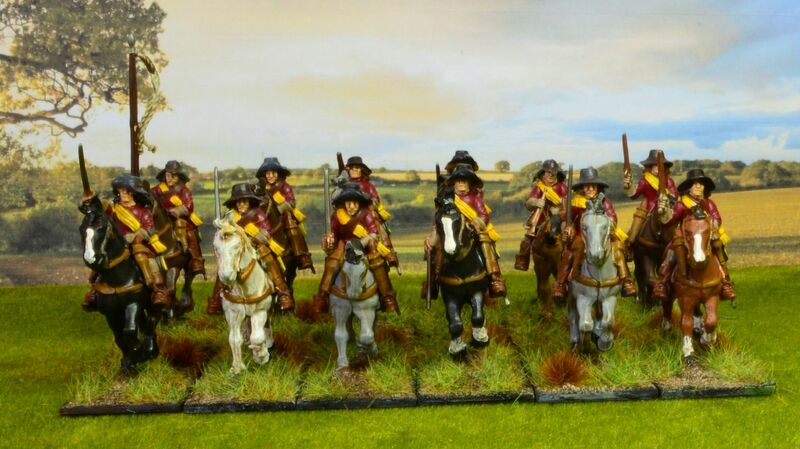 Well I have committed to my promise and here is the next unit - this time they are in red coats and yellow sashed. 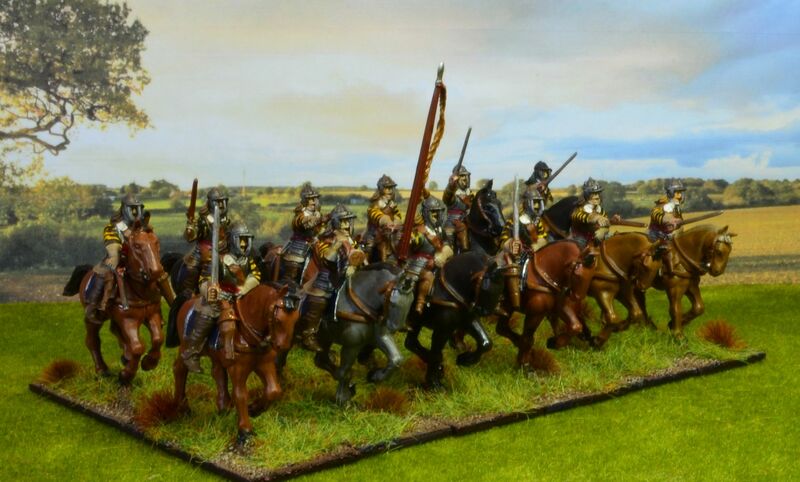 Following on from my cuirassiers I decided to tackle the rest of the cavalry before the onerous task of hitting the infantry. 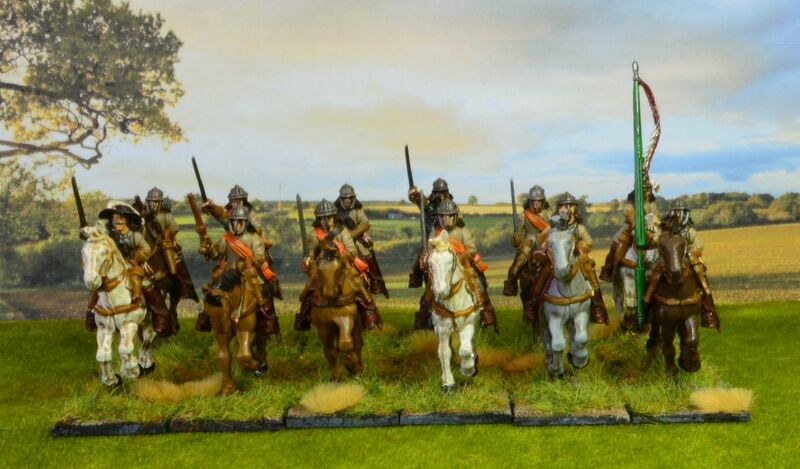 As of last night I had sitting on my table 5 regiments of cavalry all in various states of completion, so last night I bit the bullet of finishing one of these and set myself the goal of finishing one each night - so by Monday of next week all the cavalry would be painted. As most followers of this blog will know towards the end of last year I hit the phenomena that is Frostgrave big time. A considerable amount of time and money was spent sourcing and building my take on the frozen city and over the Christmas period I finished painting most of the minis I had acquired for the game. Indeed since the end of November I have been fortunate to play around a dozen games in the frozen city. As of today I now have two elementalists in my Wizard's college (level 12 and level 5) who are very keen to explore the ruins further. In this short posting I'll try and summarise what I think work about this game and perhaps some of the things that are missing/could be improved. Having grown up with AD&D in my veins I was so excited about returning to the fantasy space. Aside from my keen interest in Fantasy Warmaster, I really hoped this would fill that void missing from my old and distant RPG days. To a certain extent it has, the official range of figures are stunning, and being unfettered by uniforms and paint schemes my fantasy figures can turn out in what ever clothes they want and nobody can say that this isn't right. These have been a joy to paint and the plastic kits are a great addition. I for one can't wait for the plastic Gnoll box to come out. The building of my City has been a great journey and the praise received from both here on the blog and those that that have played on my boards has made me both proud and determined to do better. The casting of Wizards as the chief protagonists in Frostgrave is inspired. If I recall my old dungeoneering days everybody wanted a Wizard but the pain and of risk of getting him to the magical 5th level when he could cast a fireball spell often meant these classes became secondary to the prowess of a fighter or sneaky stealth of the thief. Frostgrave delivers a whopping 100% on magic; the variety, versatility and sheer scale of the magic spells available coupled with the various schools creates a wealth of choice and different progression. The Magic seamlessly fits into the rest of the games rules (or should it be the other way round?) and as I have said delivers. I do have concerns that the combat is over simplistic - ultimately any character can wipe out another on a single die roll. The 'spread' of a d20 allows for very little risk to be mitigated when you are planning your raids. I have found in the games that we have played the 'just go for it approach' has won as many times as the 'steady and cautious'. Maybe I am being a bit unfair but perhaps with so few figures on the table a more complex approach could have been determined when it comes to combat. I also feel that the range of henchmen is just too broad - why have a Man at Arms, an Infantryman, a Knight and a Templar. Much better to have a 'Fighter Class' that can pick and choose their weapons and armour. I also feel that aside from the standard stats there is very little 'character' in these henchmen. I have said in the past on various forums that I would want to see these classes develop - thieves should be better at climbing and sneaking, Barbarians should be able to go berserk, and Rangers track. How these manifest is up for debate but I am actively discussing this with one of my fellows. Ultimately Frostgrave is a simple skirmish game, pitting one Wizard against another, with each intent on capturing as many treasure tokens on the board. Its great fun, full of humour and mischief, and a game can be turned around quite quickly. The progression of Wizards is brilliant - my high level Elementalist now only needs a 7 to cast that awesome bolt and the rest of his repertoire is building nicely. However there is something missing in this game...and perhaps I am going back to my original roots ...and that is the unknown. Without an umpire, games master etc all the players can see the lay of the land, they know what's on the table and they know that any wandering monsters will be both rare and random. There are no crumbling buildings or traps to watch out for, no hidden surprises, and to be blunt little narrative. Its at this point that I must admit that I have not played the Thaw of the Lich Lord campaign and this may challenge my assumptions. My current thinking is that these games might indeed need a player to step up and become that games host - to create the scenario and adjudicate it on the board. For example the starting players don't know where the treasure is and have no idea what lies behind that wall. Come October of this year I am planning on running a multiplayer Frostgrave game at BLAM. This will pit four Wizards fighting it out to secure a hidden artefact. The Winners of each round will then go into a final with the final winner being declared the arch wizard. To prepare for this I'll amost certainly have to create the Wizards and their parties in advance, this will give me the flexibility of starting them off at a higher level. As this progresses I'll post more thoughts on the blog. Following on from my last post I have been hitting the painting table with some serious attention. Sooner or later I am going to get bogged down with work and other interests but whilst I sill have the mojo I am going to push on. 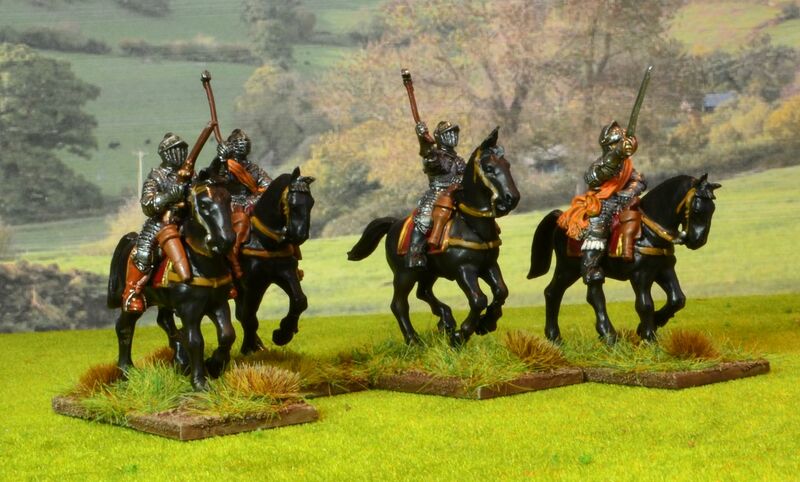 Today I bring you my Currassiers - these are a Warlord Games product. 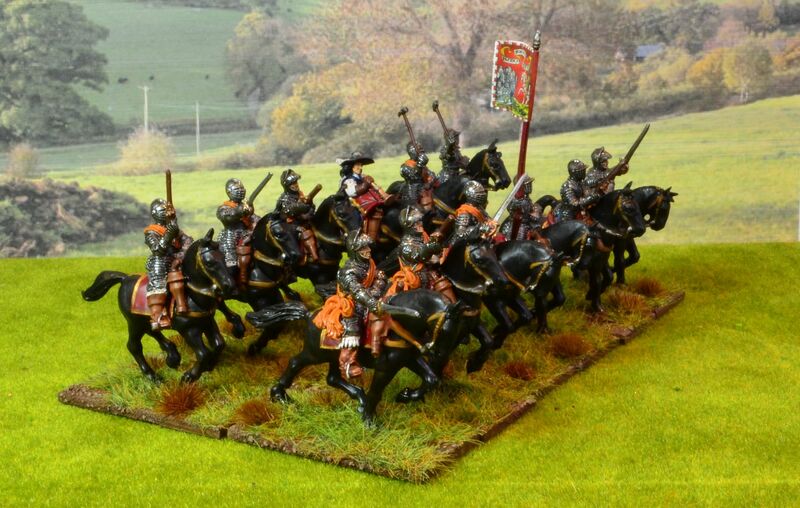 When they arrived last Friday I was surprised to see that the riders themselves were metal but the horses plastic. Indeed the mounts are the same mounts for all their ECW cavalry. Getting a good bond between plastic horse and rider was difficult so in the end I resorted to a small ball of greenstuff to aid the fixing. These were a joy to paint. 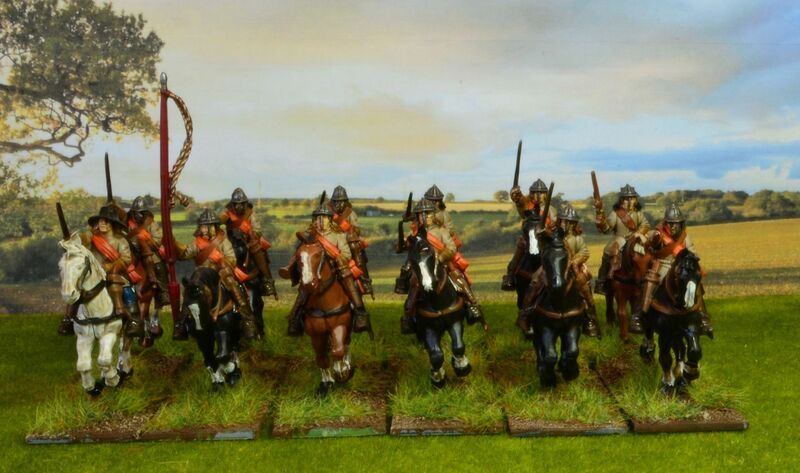 I wanted a uniform feel to this unit so all the horses were painted black and I carried the same colours across the tack, saddle blankets and other gear. 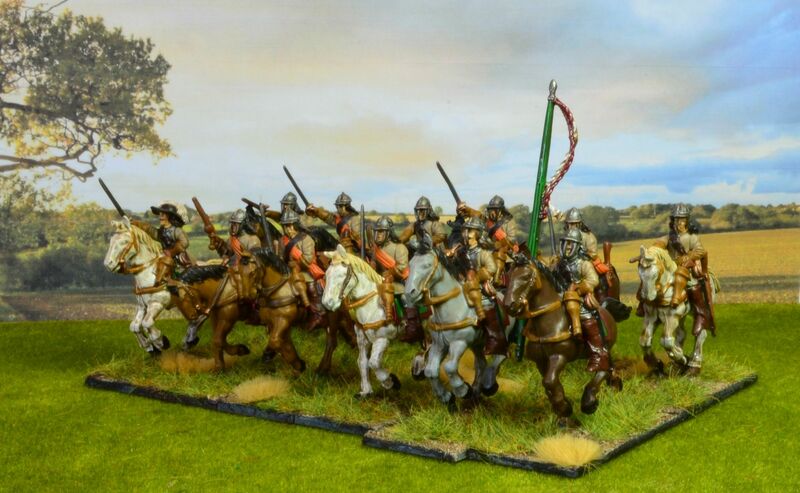 The box itself contains 12 riders. 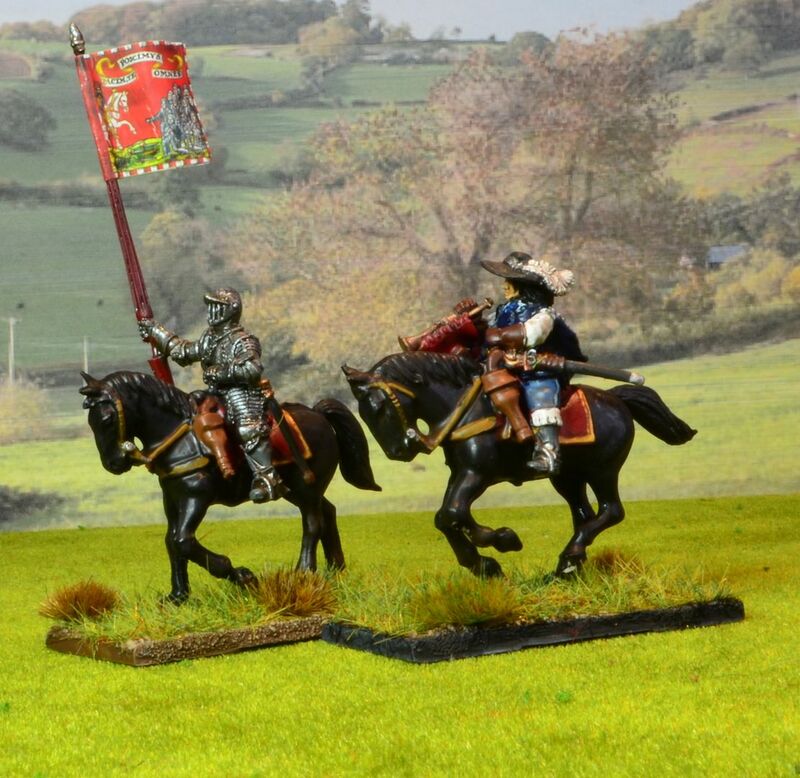 One of which can be a standard bearer (I used the flag straight from the box - General Waller's Horse), and the other is a trumpeter. 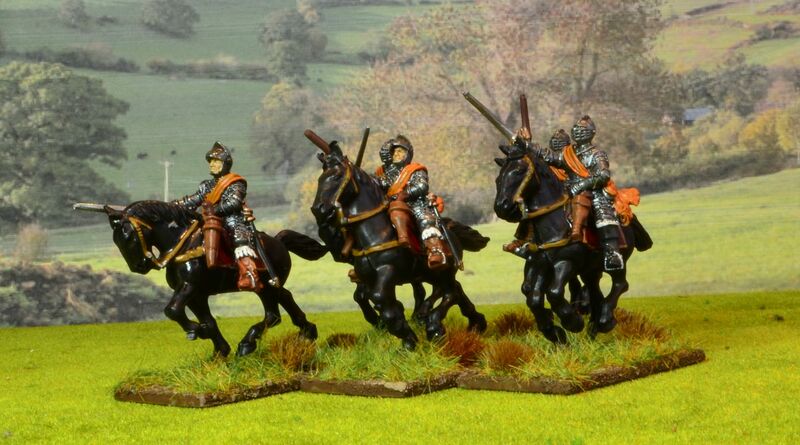 He must feel a little left out in his finery of cloth riding into battle with his armoured colleagues. 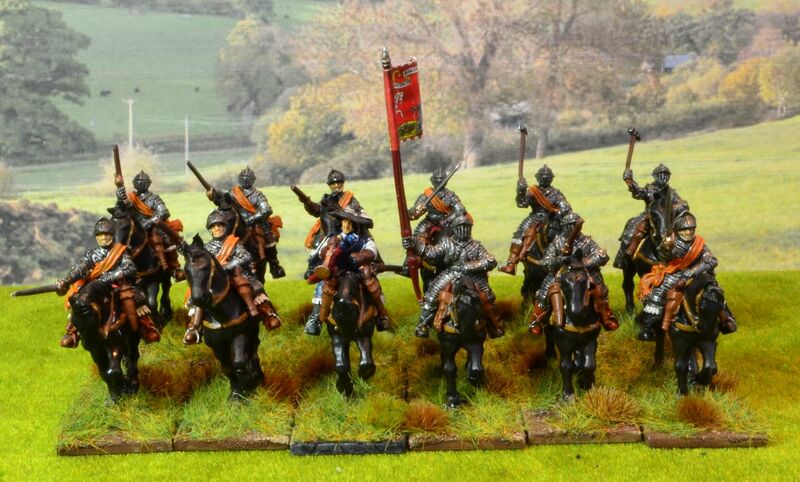 The armoured riders were all painted gun metal and following their dip I was patient enough not to matt varnish the armour. Their orange sashes denote that they are part of the Parliamentary cause. 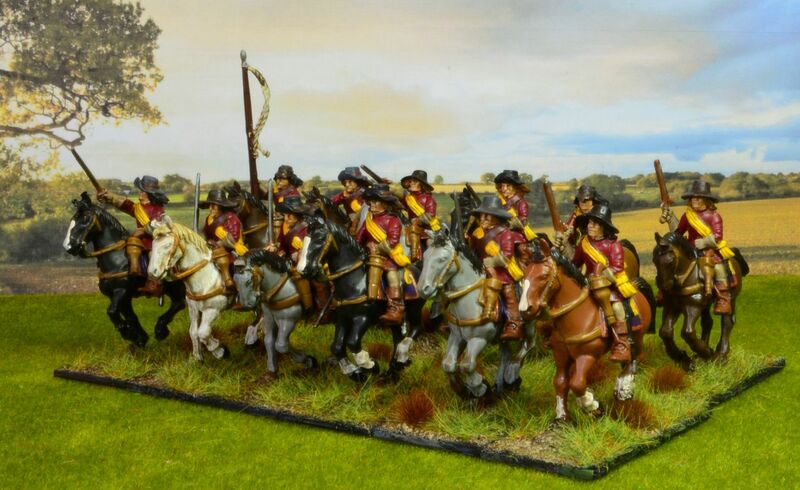 There are very few cases of Currassiers being used in the English Civil War bit the best documented is the unit raised by Sir Arthur Haselrig known as the London Lobsters. The unit received its name because they wore extensive armour that covered most of their body (except for the lower legs) making them appear somewhat like lobsters. 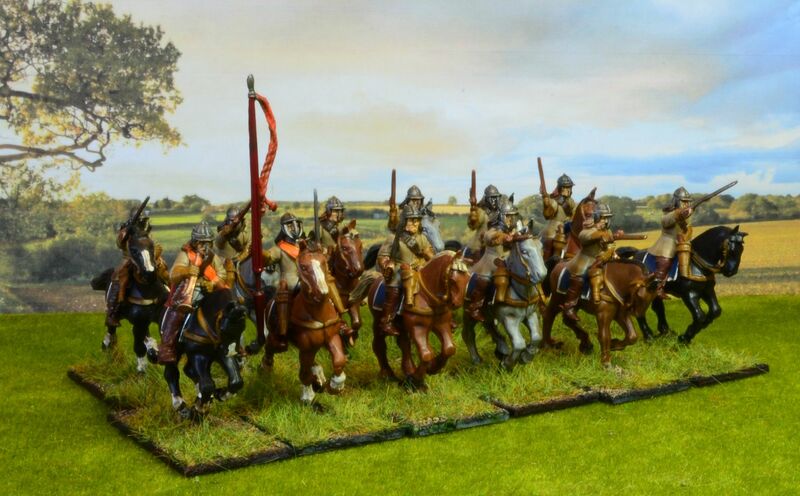 Only two cuirassier regiments were raised during the English Civil War, the other being the Lifeguard of the Earl of Essex, however, individual cavalrymen within other regiments also served in complete armour. 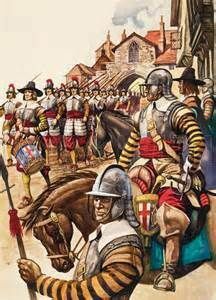 Full armour had largely been abandoned at this time, with cuirasses and helmets only worn by some cavalry, commanders and some pike units. 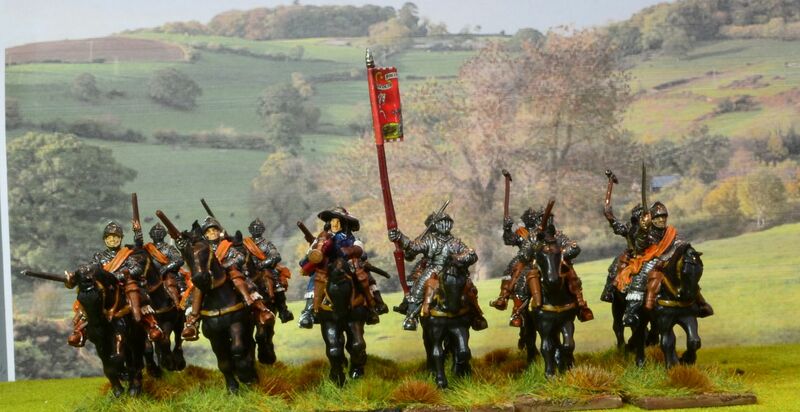 The armour of a cuirassier was very expensive; in England, in 1629, a cuirassier's equipment cost four pounds and 10 shillings, whilst a harquebusier's (a lighter type of cavalry) was a mere one pound and six shillings. 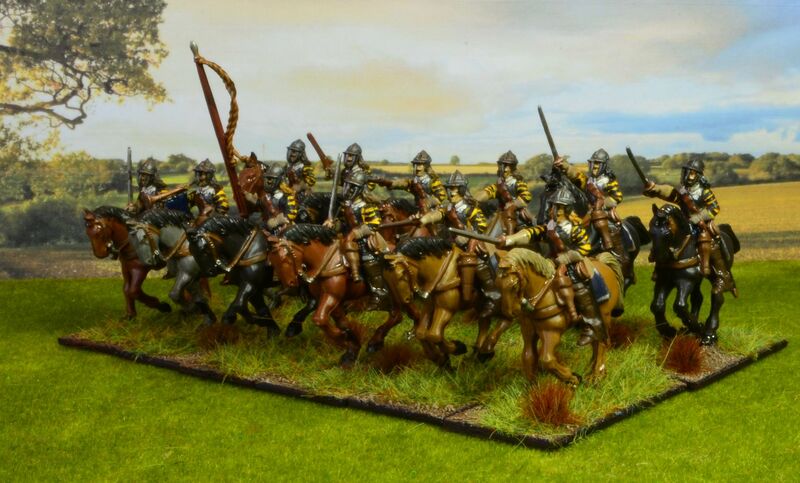 Haselrig's regiment formed the heavy cavalry in the army of Sir William Waller. The "lobsters" distinguished themselves at Lansdown on July 5, 1643. 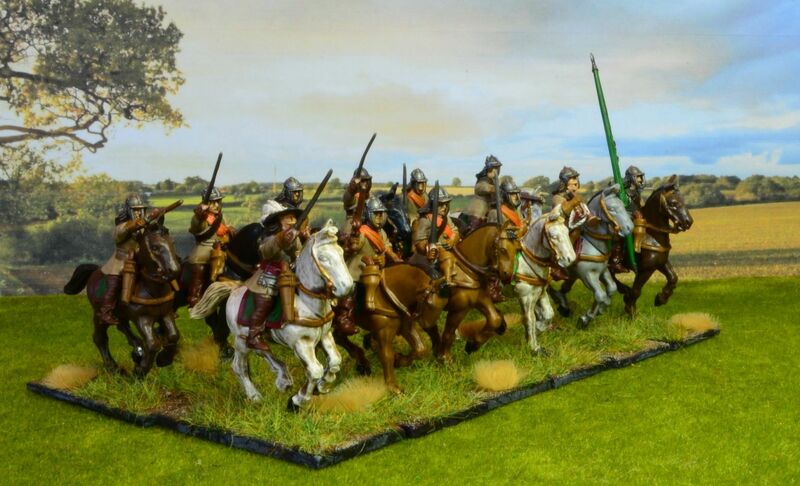 However, at the Battle of Roundway Down July 13, they met a Royalist cavalry charge at the halt and after a brief clash, retreated in disorder, the Parliamentarian army losing the battle. Though they were defeated the armour they wore apparently served them well; Haselrig was shot three times at Roundway Down, with the bullets apparently bouncing off his armour. 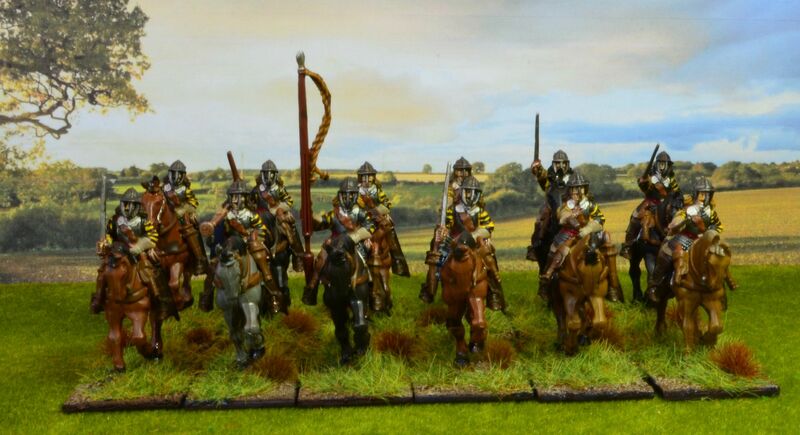 After firing a pistol at Haselrig's helmeted head at close range without any effect Richard Atkyns described how he attacked him with his sword, but it too caused no visible damage; Haselrig was under attack from a number of people and only succumbed when Atkyns attacked his unarmoured horse. After the death of his horse Haselrig tried to surrender; but as he fumbled with his sword, which was tied to his wrist, he was rescued. He suffered only minor wounds from his ordeal. 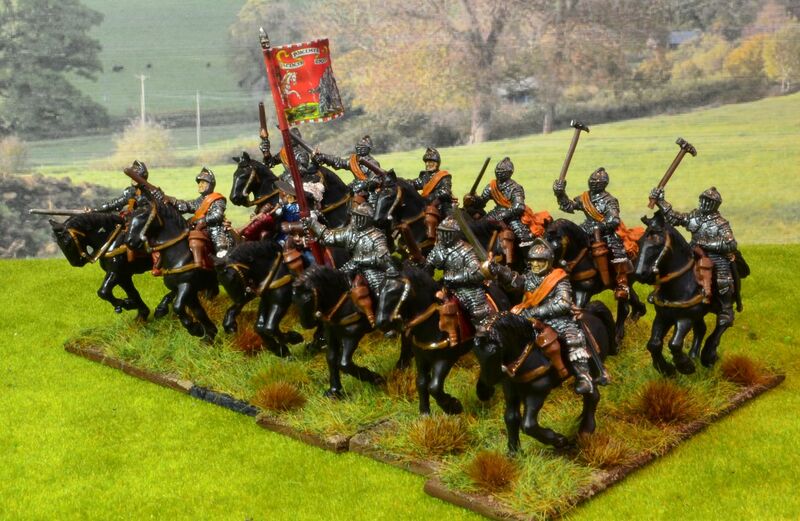 At the Cheriton on March 29, 1644 the unit attacked a royalist regiment of infantry under Sir Henry Bard. 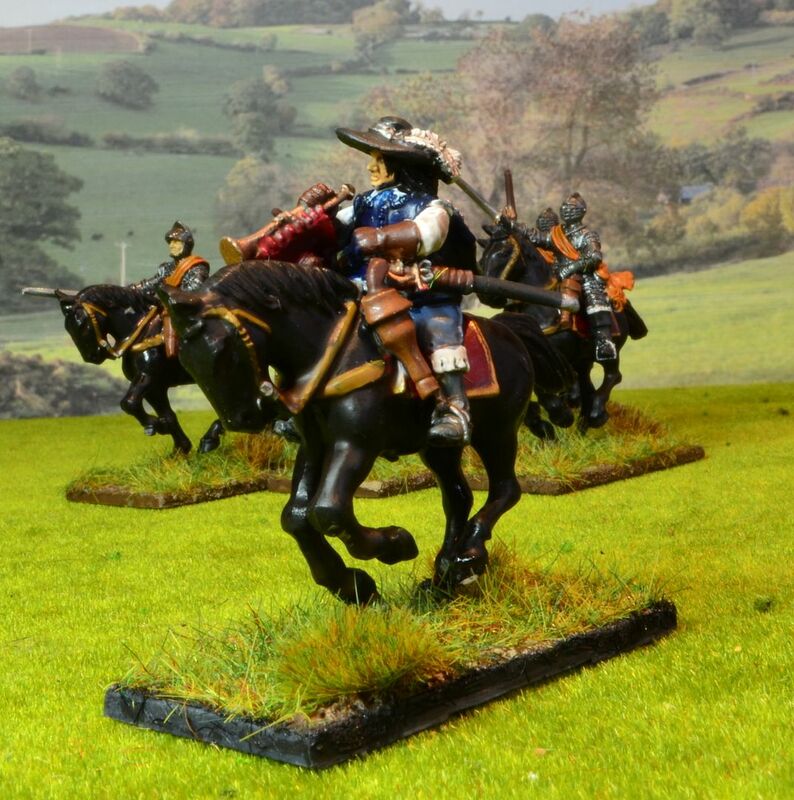 Bard's unit had advanced towards the Parliamentary cavalry, but had moved too fast and were no longer in formation with the rest of the Royalist infantry. The Lobsters saw this and Haselrig led 300 of them against Bard's regiment. It was completely destroyed, with all infantry either killed or taken prisoner. Parliament eventually won the battle. Mrs Shed went away for the weekend so I was free, once chores completed, to spend some serious time painting. 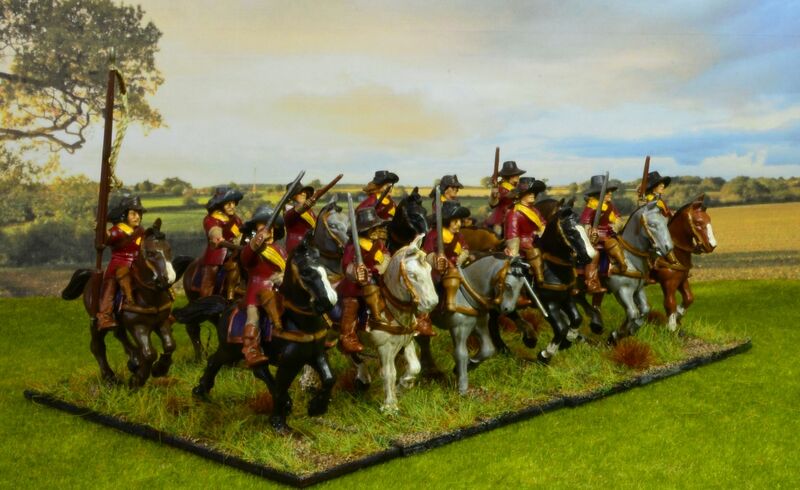 The Cannons were sourced from Perry - 4 demi culverins (9lbs) and 2 minions (4lbs) (along with their crew) plus a further two falcons from Bicorne miniatures and a pack of their gun crew (8). We have agreed that Medium guns will be denoted with four crew and light guns with three. In total I spent around £78 on this little lot. Prior to painting these I did some research on what colour the carriages should be and sadly there is very little documented evidence on the colour schemes but those more worthy than I all agree that they would have been painted/stained to protect the timber frames. In the end I chose to paint mine a mix of yellows, blues and reds. The iron work by common consent was painted black. Likewise the crew (of which there are 30) have been painted in a variety of colours (civvies if you wish). 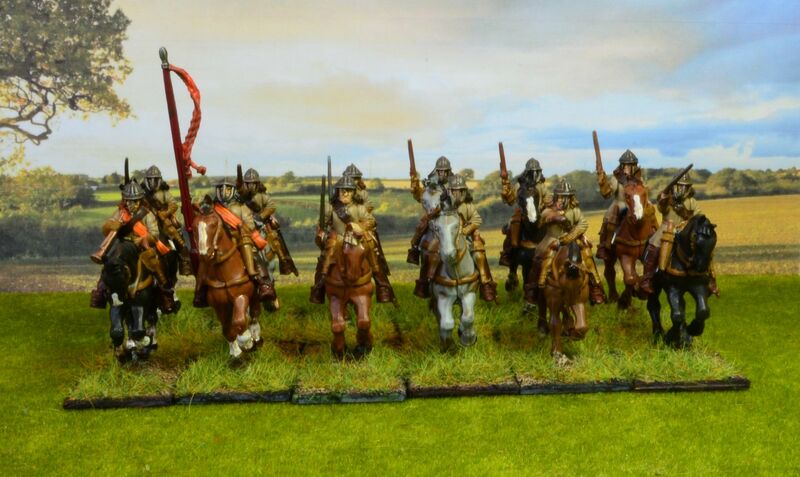 Although the Bicorne gunners are slightly larger than the Perry's I have mixed them up to give some variety. Lets face it not everybody in real life is the same size. The bases are plasti-card (6cm x 12cm) and have been augmented with a few barrels from my pirate terrain along with the various kit that came with the gun purchases. 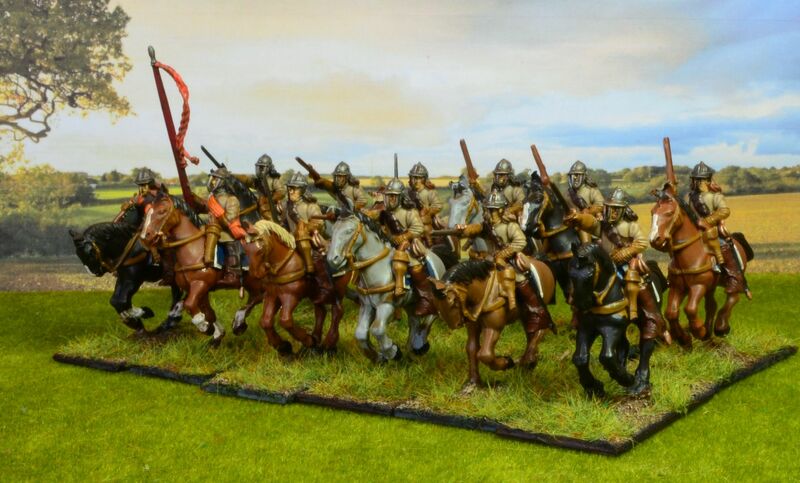 Once all the guns & crew were painted I mounted them on the base and then carefully added the ground mix. This was then painted a chocolate brown (tester pot) and dry-brushed with tan. The base was then topped off with a few scattered tufts. Finally I edged the bases black with a black permanent marker. I'll eventually invest in some larger guns and mortars but this will do for now. I am very pleased with the results but it also highlights how long this journey is going to take.